Mercedes Benz’s classic off-roader is beginning a new chapter of its success story which has spanned more than 35 years. With its continuously improved technology and high-class equipment specification, this cult all-terrain vehicle has consistently satisfied the highest expectations of off-road fans. The G-Class models, G 500 and G 63, offer up to 16 percent more power with the added benefit of lower fuel consumption. The range includes the G 500 with a new, powerful 4.0-litre V8 biturbo engine. A new suspension setup, together with more sensitive ESP® control, results in increased driving stability, safety and road comfort. The exterior and interior have also been given an upgrade. At the same time, an exclusive AMG special edition will be available. The new 8-cylinder powerplant in the G 500 can point to an exclusive heritage. It is based on the new generation of Mercedes AMG V8 engines that have already coaxed exceptional levels of performance out of the Mercedes AMG GT and Mercedes AMG C 63. For use in the G-Class, the V8 has been modified to deliver 310 kW (422 hp) with torque of 610 Nm. Other standout attributes include a spontaneous response and high tractive power which are made possible, for example, by two turbochargers, which instead of being configured on the outside of the cylinder banks are arranged between them in the V – the so-called “hot inside V”. This layout allows a compact design, optimal response and low exhaust emissions. High efficiency is ensured by Mercedes Benz’s use of piezo direct petrol injection with spray-guided combustion. Maximum strength with lowest possible weight is guaranteed by the aluminium crankcase of the V8 engine. The cylinder bore surfaces feature Daimler’s NANOSLIDE® technology, which makes them twice as hard as conventional cast-iron linings. This minimises both internal friction and fuel demand. “The G-Class always wants to get ahead. With its peerless characteristics, proven technology, unsurpassed driving comfort and excellent functionality, the G-Class is a clear icon in the segment of true off-roaders. 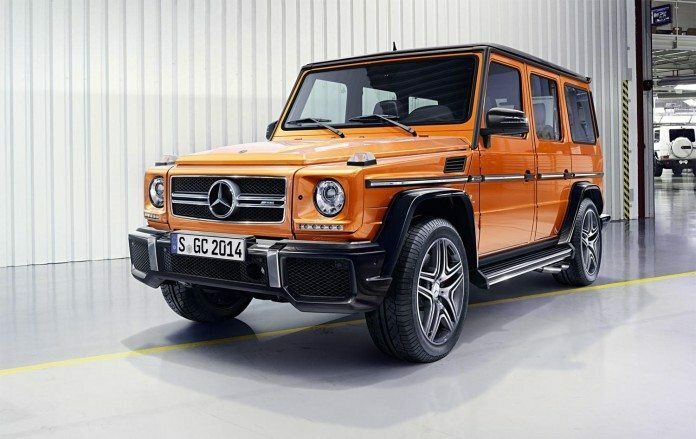 The new model will be highly welcomed by car enthusiasts in the Middle East as the G-Class offers them what they are always looking for – the best or nothing,” said Dirk Fetzer, Director of Sales & Marketing at Daimler Middle East & Levant. Both the G 500 and Mercedes AMG G 63 are equipped as standard with an ECO start/stop function that reduces fuel consumption and emissions by switching off the engine when the vehicle is at rest, e.g. in a traffic jam or at traffic lights. The standard suspension setup has been revised with optimised shock absorbers for improved control of body movements and even greater on-road ride comfort. An adapted ESP® setup makes for enhanced driving dynamics together with increased driving stability and road safety. Optimisations to ASR and ABS result in improved traction while shortening the stopping distance when braking. Visually, the new G 500 models are especially easy to identify by their restyled bumpers and now standard AMG flared wheel arches in the colour of the vehicle. On the inside, the G 500 features an eye-catching instrument cluster in two-tube look with 11.4 cm multifunction display and redesigned pointers and dials. The two AMG models also sport a redesigned instrument cluster.